With a light West wind about 4-5 mph Dave I set a first beat to No 4, then 8P, 5S, 6S, 7S and back through the start. There were 9 starters from RSC and 3 more from Paul R’s Aero training group. First back through the start line were Newton & Ellen (RS200) who had pulled out a useful lead on Dave L and Mike A in Lasers, who were split by the first of the Aeros. Adrian (Vago) came through in 4th place closely accompanied by James in another Laser. Chris H (Comet) was 6th sandwiched by the other two Aeros. Further back, Rick in 7th and Alistair S in 8th (both in Lasers) were having a good battle and young Ben H (in the only Topper out today) followed them in 9th place and he was finished at the end of his first lap. .At the end of the second and last lap Newton & Ellen had increased their lead and crossed the line in a clear 1st place with Dave L in a comfortable 2nd place (if you can be comfortable in a Laser in a light wind !). James had caught and passed both Adrian and Mike and rounded No 7 in 3rd place, but Mike spotted a slight wind shift and just pipped James across the line. Adrian finished in 5th place with Chris some way behind him in 6th and Alistair got the better of Rick to finish 7th. On handicap the first two positions should be safe, but Chris could well leapfrog the three boats ahead of him. Thanks to Dave I and the OOD Team Kate H, Richard M, Peter R and Mick G.
The Frostbite Series starts this Sunday. One hour handicap starting at 11.00. The weather has changed on cue so wrap up warm. The helm of the year calculations can be found here. Well done David. This morning it was blowing a hoolie ! WSW 20 mph with some vicious gusts. Mike A set a relatively short course, 5P, 9S, 4S, 7S and back through the start, but in these conditions that probably seemed a long way to go for those actually sailing. There were quite a number who decided it was wiser to watch than to swim and some of the eight brave souls who ventured out decided to trade down on sail size. David C and David M went down to a Radial rig, James went down to a 4.7, Roland switched from his National 12 to a Byte, Hadey already had a 4.7 rig so could not go any smaller and William and Chris H were stuck with no option. Adrian who could have gone down to a smaller size decided to stick with his Rooster rig !! Roland was first to venture out onto the water which gave everyone else the opportunity to see what they were in for ! Eight boats went out to start and many of these capsized before they even managed to start and there were many more capsizes after the start ! 1st David C (Laser); 2nd James P (Laser); 3rd Adrian (Rooster); 4th Hadey (4.7); 5th William (Topper). Somewhat surprisingly all five still on the water at the end of the Pursuit Race decided that they wanted to sail the second race ! At the end of the first lap David C led from James with Adrian 3rd and some way further back Hadey 4th and William 5th. At the end of the second lap these positions had not changed but Mike decided to finish Hadey and William as the leading three had already crossed the line to start their third lap before they had finished their second lap. David C capsized on the third lap and final lap up near 4, allowing James to nip past. David was catching him on the way back to 7, but James just managed to stay ahead and crossed the line with 12 seconds to spare ! Adrian with his huge sail came home in 3rd. The final positions were exactly the same as for the Pursuit Race above. Well done to all who braved the conditions, especially to the youngsters William and Hadey who persevered despite numerous capsizes. Thanks to the OOD Team who had a very busy time – Brian M, Colin H, Dean and Nick J and Paul R.
A quick report from the National Schools Sailing Association’s Match Racing event that was meant to take place this weekend (7/8th Nov). 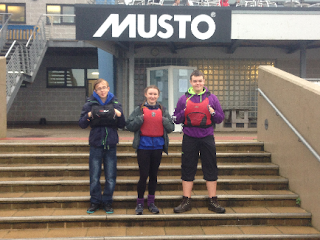 RSC entered a team in the form of Hadey (helm), Hugh (main), and William (bow). 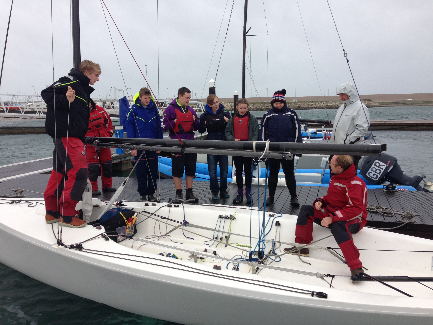 The event was held at Weymouth & Portland National Sailing Academy (the venue of the 2012 Olympics), and using the RYA’s fleet of Elliot 6m keelboats, that were also used in the Olympics. Unfortunately the weather didn’t co-operate with Saturday seeing mean wind speeds of 31 kts (force 7) with gusts not quite topping out at 50 kts (49.29 kts). Winds started a little calmer on Sunday, but with the forecast showing a rapid return to speeds above 20 kts there wasn’t going to be enough time to run enough races to make a meaningful event, and the organisers decided to cancel the whole event. This at least meant that the RYA would return the boat hire fees. So obviously disappointing in some respects, but the team did at least get to try out the Elliots on the moorings (see photo below), and the NSSA and the Umpires laid on briefings on match racing tactics. 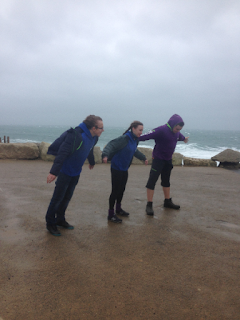 There was also the opportunity for an impromptu visit to Portland Bill (to check how really windy it was), and a team trip around the yacht chandleries in Weymouth. The team also developed in-depth knowledge of the opening times of Fish & Chip shops in the Weymouth area. The NSSA hope to replace this event at some point using SB20’s on Farmoor reservoir at Oxford – where hopefully the wind will be more compliant. Cut a path to the septic tank, for access. There is a bollard, by the undergrowth near the old water-ski sheds, marking the rough position. Cut in a direct line from it. The tank has a concrete top. Suggest using the brush cutter with the blade, but be careful of bricks etc. A misty Autumnal morning with very little wind, but surprisingly there were 16 starters. Adrian had a difficult job setting a course as there was not enough wind to suggest which direction would offer a first beat ! In the end he settled on 6P 9S 5S 7P 8S with the start line from the flag pole to the pin which was roughly in line with No 8 but further out. For the second week in a row the final two marks became irrelevant as the leaders rounded 5 and were finished shortly after. The positions changed considerably during the course of this short race due to the vagaries of the wind and the lack of visibility in the thick mist. William in his Topper led by quite a way, but rounding 9 he set off in the direction of 4 rather than 5. It was not possible to actually see either mark in the poor visibility ! A number of following boats set off in the same direction as William before they twigged they were heading west. One of the rescue boats was unfortunately parked in front of No 5, which did not help the fleet to spot exactly where the mark was. Karen came to the rescue by politely asking them to move so that No 5 was revealed faintly in the distance. 1st Newton & Ellen (RS 200); 2nd Sylvia (Laser); 3rd Karen (Laser); 4th Curtis (Otter); 5th James (Laser); 6th Rick (Laser). Despite the lack of wind everyone stayed on for the second race of the day. The course was adjusted slightly by dropping No 9 and Mike A (Lightning) led round the first mark but was passed by a trio of Lasers, Richard, Rod and Dave L, before reaching No 5. In the light wind it was quite tricky to manoeuvre and Hadey got caught out by Karen on starboard and reluctantly had to do penalty turns. There was only time for one lap and there was some confusion at the finish line as Richard in the lead received the finish gun as he crossed the line heading towards No 8. The following boats were not sure whether the finish line was before the mark or after the mark. Rod veered off to cross the line which allowed Dave L to slip past him. Mike A slightly further back in fourth place thought the boats ahead of him were being finished before the mark and headed directly for the line rather than carrying on towards 8. This cost him dearly as he got into the lee of the trees on the bank and it took him 5 minutes to get back to round the mark allowing Sylvia to come through to take fourth place. After these four boats had crossed the line the wind died away completely and Sally, Curtis, James and John C gave up all hope of finishing and started paddling to retirement. The prize for tenacity goes to Rick who was determined to finish and finally crossed the line 43 minutes after the first boat. Thanks to Adrian and the OOD Team Pat, Mick, Richard M, Paul B and Simon R.